How you talk to people with drug addiction might save their life. 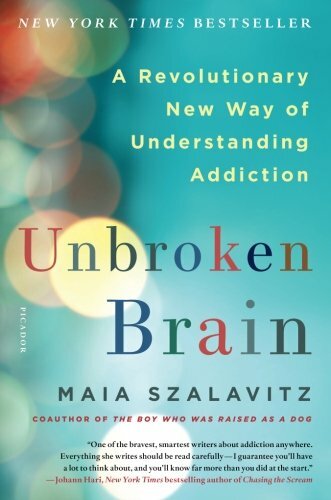 MAIA SZALAVITZ: There are people who are trying to promote brain surgery for addiction using electrical stimulation of that area and it doesn't work any better than methadone. And that's not to say that methadone isn't the most useful drug we currently have, but it does not involve invasive surgery. I should say methadone and buprenorphine, the opioid agonists, are the best treatments that we have for opioid addiction. And what they do is two things: The first thing is they cut the death rate by 50 percent, which is – this happens whether you continue using on top or not. So that's pure harm reduction and that's wonderful. If we can keep you alive long enough that you stabilize your life, that is a lot better than having you die. The other thing that they do is they allow people, who are ready, to stabilize their lives. So you couldn't tell right now if I was on a maintenance treatment or not because basically once you get a tolerance to these drugs you are not high or impaired, and you can drive and you can work and you can love and you can do all of these things, but we don't understand, we think, "Oh you've just substituted one addiction for another." No, what you've done is you've substituted compulsive behavior despite negative consequences, and now you just have a physical dependence. And that's not a real problem as long as you have a safe and legal supply. I think the most important place to start is that addiction is a learning disorder; it's not a sign that you're a bad person. And if you want to have a safe and addiction-free, or at least lower level addiction, workplace or school, you want people to feel included and comfortable and safe and you don't want this to be an adversarial thing. The research shows that the best way to get people help is through compassion and empathy and support, and absolutely not tough love. There may be situations in which an employer has to fire somebody because their performance has just degraded so much that there's no other option, but they shouldn't think, "I'm doing them a favor by firing them, because that will make them hit bottom and it will help them." Sometimes that happens, but sometimes they just go on to a life of homelessness and then die. So you can't assume that creating extra-negative consequences is actually going to help a person with addiction. What you want to do is ally yourself with them and, presuming this is an employee that you want to keep, help them realize that this is not a sin. "I am not trying to control you. What I want to do is for you to be at your best – at work, at home. And you're not being at your best right now, so what can we do to help?" Well, I think the important way to start that conversation is to first not assume that a problem that you think might be drugs is drugs. The person could be having any number of mental illnesses, the person could be having, you know, there's a million things that could look like oh you think they have a drug problem and there's something else going on. So if you approach the person with respect and not assuming that you're going to find a drug thing unless, obviously in some situations it's completely obvious, but in most situations it isn't. And so the best way, I think, is to say, "I've noticed XYZ. I'm worried about you. I'm concerned about you. I want to make sure that I can help you." So it comes from a place of not like, "I caught you!" you know, because there's so much advice that is just like, "Well, threaten to fire them if they don't change, and drug test them immediately," and all of this kind of stuff which destroys trust. So, that's not to say that if somebody is doing something dangerous or clearly inappropriate that that behavior doesn't need to be addressed, but it is to say that you can approach somebody in a confrontational degrading and sort of high-powered manner or you can approach them as an equal human being deserving of respect. And if you do the latter you will have much better results. And I have to say, it's almost and never going to be easy because people, whether they have addiction or mental illness or anything else going on with them, often don't want to admit to themselves that there's a problem. In the addictions field there's been this whole thing 'we've got to break through denial' and everything like that. Well, people have denial for good reasons. If we didn't have denial everybody would be sitting around obsessing about death, or at least I would be. It's a defense mechanism because we need defending. So recognizing that can allow you to approach somebody not from an attacking stance; approach somebody from a befriending sort of stance. And that is hard to do and some people are going to get very defensive no matter what you do and it's not going to be a pleasant conversation most of the time. But you can minimize harm. I mean, this whole thing always comes down to like reducing harm, making things less unpleasant if you can't make them non-unpleasant or actually pleasant. But the main thing is to see them as a full human being. And I think really important in getting people into any kind of treatment is that, and I always say this to parents or anybody who has an addicted loved one, the first step should always be a complete, thorough psychiatric evaluation by somebody who is not affiliated with any treatment organization so that you can know going in what the problems may be and what kind of services you should be seeking. There are some absolutely wonderful treatment providers who, if somebody shows up who is not appropriate for their services, they will send them away. There are also unfortunately many people who will just take that person to make a profit off of them and they will not help that person and they will not inform them of that, for example, if they stayed on maintenance they would have a 50 percent reduction in their death risk. They would just say, "We do abstinence; that's good for you." Blah. And so I think, again, this is a sort of "buyer beware" industry. In the rest of the medicine it's pretty easy to say, "Okay, here is PubMed, this is the treatment for this particular cancer that has the most evidence behind it, and here's the guy who designed the best treatment. Let's go find this person." In addiction, it's virtually all based on like reputation and advertising, and it is very difficult to actually find programs that provide evidence-based care. This is also a problem in mental health more generally. But anyway, the point here is that in order to get care that is good for you, you need to advocate for yourself, and if you have an employer that's willing to advocate for you that's even better. The way I think that employers could do an enormous amount of good is by demanding that the treatment providers they work with, the treatment that they cover, is evidence-based, and is not restricted because of money but is restricted because stuff that doesn't work shouldn't be paid for. Addiction is a learning disorder; it's not a sign that someone is a bad person. Tough love doesn't help drug-addicted people. Research shows that the best way to get people help is through compassion, empathy and support. Approach them as an equal human being deserving of respect. As a first step to recovery, Maia Szalavitz recommends the family or friends of people with addiction get them a complete psychiatric evaluation by somebody who is not affiliated with any treatment organization. Unfortunately, warns Szalavitz, some people will try to make a profit off of an addicted person without informing them of their full options.